It seems like every holiday has an aftermath when you’re a parent. Dressing up in costumes can be fun at Halloween, but then you have to deal with the negotiations over how much candy is too much candy. Our children receive gifts on their birthdays, but then we’re embarrassed when they refuse to thank the gift-givers. And on Valentine’s Day we arm them with cards for the entire class, but when they return from school either they didn’t get as many valentines as everyone else or the one child they hoped to particularly impress spurned their offering, leaving us with tears and echoes of the disappointment and rejection we felt as children when the same thing happened to us. While it might seem obvious that the day celebrates the life of St. Valentine, the real origins of the celebration are actually quite murky and likely lie in a pagan Roman purification and fertility ceremony. It’s possible that a Roman emperor wanted single men who would fight in an army outlawed marriage and that a priest named Valentine continued to perform marriage ceremonies anyway. Dozens of Christians named Valentine were martyred and became saints in the early church, and two priests named Valentine were reportedly both executed on February 14th sometime in the third century. Later, the Church converted the pagan festival into a Christian holiday to make conversion to Christianity more palatable. Many other poets and playwrights continued in this vein over the years and St. Valentine was transformed from an intermediary between humanity and God to one between lovers. By the 17th century, the meaning of the word “valentine” had shifted to becoming a person or relationship: in Britain, young people would draw lots to gain some hint of their future marital fortune, and would refer to their suitor as a “valentine.” In the 19th century the meaning had shifted again and was most often used to refer to the fancy lace-paper card which a young person would buy and send to their valentine. The 19th century also marked the transformation of our view of children from contributors to the family income to an object of sentimental devotion, beginning the elevation of children’s needs above those of adults. Cherubic youngsters pictured in juvenile valentines of the period mirrored the newly refashioned image of a cherubic Cupid – a far cry from the Roman God whose arrows were sharpened on a grindstone whetted with infants’ blood. Even early on, Valentine’s Day had an insidious underside, with “attack valentines” depicting assertive women, flirts, and coquettes implying that the first wave of women seeking suffrage around this period were overstepping their bounds. And one early observer of a valentine mill commented on the “disenchanting” and “dingy” sight of workers piecing together layers of lace and paper for eleven hours a day. Today lovers are once again the primary focus of marketing related to Valentine’s Day, perhaps because a holiday geared toward a celebration of their relationship has the potential to generate more expensive purchases than one that is celebrated by everyone. Children are the exception to this rule because it helps marketers to sell us more stuff as adults: many of us have memories of arts and crafts, candy, time off from school work (permitted due to the secular nature of the holiday) and an egalitarian exchange of sometimes handmade, but often purchased, cards – with thousands of designs available in handy class-sized quantities. These fond memories set the stage for the heightened expectations of a lifetime of recognition, with many young women anticipating a shower of gifts and affection, and young men uncertain about how to meet these expectations (card? Flowers? Chocolates? Movies? Dinner? Do I really need to do more this year than I did last year?). Many of the people that researchers surveyed said they exchange gifts because it is “the thing to do” or because the holiday is about “going to dinner and exchanging gifts”: far from representing an exchange of intimacy, the pressure is on men to make expensive purchases that function as a sexual lubricant. Must we spend money to express love? When we talk with children about holidays it’s tempting to try to go back to the source; to make the holiday about what it used to be about. But with Valentine’s Day, does this mean we go back to just the simple exchange of cards from the 1800s? Or the games to draw lots and test your luck in love of the 1500s? Or the non-specific martyred saint(s?) of the third century? Or we could just say “Valentine’s Day is about love” (which it sort of is…) and be done with it? But if it’s really about love, why do we need to buy so much stuff? In part, it’s the peer pressure: not giving a gift when everyone else does sends the signal that a relationship is not important or the desire to terminate that relationship. We thus feel compelled to give gifts lest we send a message of hostility by not giving one. We also have to give the right gift: perhaps the man doesn’t realize there’s something ‘off’ about gifting a woman an exercise tape until she gives him “sand gathered from the beach where they first said ‘I love you,’” but he will pretty soon afterward and he won’t make the same mistake twice. It’s helpful that the $19.6bn is very close to the $19bn that Facebook paid for WhatsApp, because a number of websites put together lists of what Facebook could have bought instead with that money. Like an MMR vaccine for every child in the world. Clean drinking water for every person on the planet would only have cost $10bn. Let me be clear: I don’t think there’s anything wrong with going out to dinner or buying a box of chocolates every once in a while if in that moment it feels like these gifts express love to your partner. But I do think there’s something wrong with teaching our children that gifts are the best way to express that love. 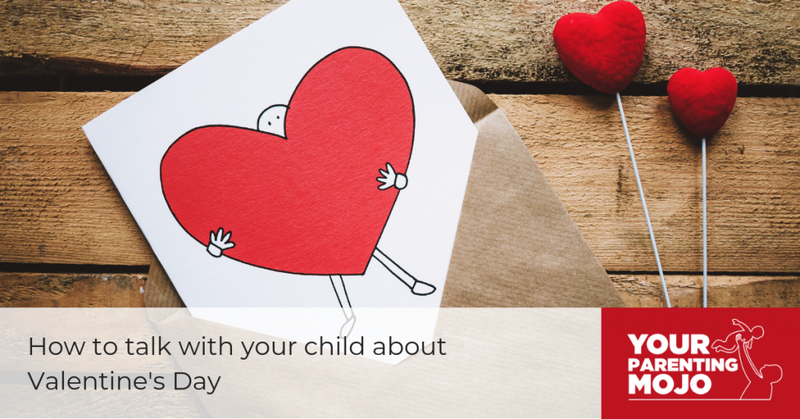 If you decide to celebrate Valentine’s Day, talk with your child about what the day means to you personally. Discuss the practice of giving cards and gifts, and ask if your child wants to participate. Most schools have a ‘cards for everyone or cards for no-one’ policy so nobody feels left out, and if your child wants to celebrate a particularly special relationship with another child they should do this outside of school hours. It may be confusing to children to give them a message that ‘we give gifts to people we love’ but then tell them they have to give valentines to everyone in their class. You may want to frame valentines as something that are given out in the spirit of fairness (most children have some understanding of fairness at a relatively early age) rather than representing a true gift. If your child chooses to give valentines, talk with them about the money spent on them and what it could be used for instead. Consider cutting simple hearts out of paper you already have on-hand, which will make the process cheap and fast. Prepare your child for what will likely happen at school. Even though schools may have rules about everyone giving cards in the younger grades these may be relaxed as children get older. Not giving cards in the early years might be remembered and children may decline to send your child cards once this happens. Discuss how your family shares that you love each other, and reiterate that you are confident that your child loves you even if they don’t give you a valentine. You might suggest that they privately approach their special friends during the day with a message: “I’m so glad you’re my friend because…”. Consider doing some good with the $143.46 you saved by not spending on themed gifts. Maybe your family could use the money for a rainy day fund. Or you could bring a home-cooked meal to a senior in your community who would enjoy some company. Or give to a charity that is meaningful to you, your child, and your community. A child who is old enough to understand valentines is also old enough to understand a conversation about what love is, how we express it, and how not everyone has the luxury of spending money on valentines. My aim with this post is not to take all the joy out of Valentine’s Day. If you do genuinely enjoy the occasion and celebrating it is important to you then there’s absolutely no harm in sharing this with your children. I aim to encourage you to not just do Valentine’s Day because everyone else does it, but to approach the day with intention that reflects your values and parenting goals.